If you are interested in that history, an excellent historic novel is Taipan. The novel portrays how many thought that Hong Kong Island was merely a “rock” and not worth having. It is similar to views in the U.S. on the purchase of Alaska–“Seward’s Icebox; Seward’s Folly.” These skeptics were soon proven wrong. 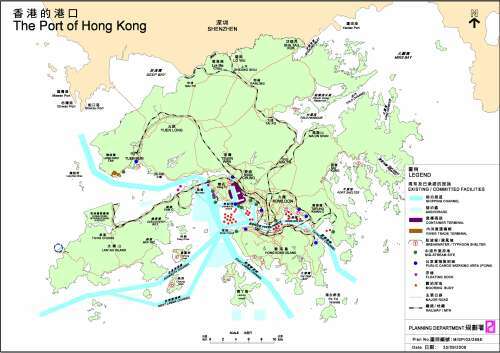 Like NYC, Hong Kong island and Kowloon peninsula have together a long coastline for port facilities. In addition, this harbor is deep and offers a safe haven for ships while being in close proximity to the Pearl River Delta Region. The Pearl River Delta region is a huge industrial region in southern China. In the past, cargo was taken off ships by longshoremen. But gradually the world has gone to packaging everything in containers. These containers are the size of semi-truck trailers or train cars. This saves in labor and time. Hong Kong has been such a container port for almost 40 years. What you see in a container port are the rows of hoists that move containers around the port and on and off ships. If you’ve ever seen a ship loaded with containers, it looks very top heavy and you wonder what keeps it from tipping over. Oceanographers study Pacific Ocean currents by tracing cargo that has fallen off such ships. In 2009, Hong Kong ports handed 21.0 million twenty-foot equivalent units (TEUs). The port is a major hub port with container ships going to over 500 destinations worldwide. The port is the key to Hong Kong’s continued economic prosperity, and that prosperity is tied to Southern China. Hong Kong, handles 89% of the total cargo that flows through Hong Kong. And about 70% of container traffic handled in Hong Kong is related to Southern China. 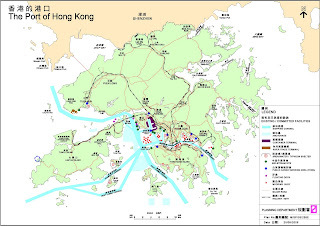 In 2009, 205,510 ships, comprising both ocean-going vessels and river trade vessels for cargo and passenger traffic, visited the port of Hong Kong. >What do you mean about being a transition port? I think port is very big matter for Hong Kong.Because its so many effective to increased total economics.Here showing very nice picture for every port.I hope this post is really helpful for every person to know every things.I like this post.